We headed up to Leven Canyon for the first camp of the year. An excellent location which included a walk around the loop track with lookouts. Then a visit to the Leven River at Taylors Flats - Loongana pictured. More pictures in the archive. The overnight athletes camps continue this year with Bakers Beach and Gowrie Park being recent destinations. Pictured here are the walking group that assembled at the Gowrie Park walk on the 6th April. A smaller group tackled Mr Roland in the distance. Rev Andre Scheepers led some excellent devotions at the event from Romans 1:15-17 and John 1 on the subject of our active faith in Christ. One recent change introduced on the 24th March was the commencement of the use of a new Psalter. The selected books come from the Free Church of Scotland and are available in a variety of formats - words edition containing both new and old words, sheet music (staff) edition and sheet music (sol-fa) edition. present to witness the event. Andre becomes the 7th inducted minister of the congregation and fills the vacancy that commenced in July 2005. Andre is here pictured answering the questions to the Minister elect that are being put to him by Rev Rowland Ward, clerk of the Southern Presbytery. Overseeing is Rev Sjirk Bajema, moderator pro tem. Call acceptance - 7 October!! It is with great joy and thanksgiving to God that we announce that Rev Andre Scheepers has accepted the call to the congregation. This followed a time of much prayer and reflection. A date for the induction service has been set for 7:30 PM - Friday 7th December at the Ulverstone Civic Centre. Pictured with Andre and Sue on the occasion are the congregation and visitors. [Refer photo archive for more pictures]. Psalm 96:4 "For the LORD is great and greatly to be praised"
Call to Rev Andre Scheepers - 7 September! Following seven months of truly edifying ministry from Rev Andre Scheepers a Commission of the Southern Presbytery met with the congregation on the evening of Friday 7th September 2012 to moderate in a call. 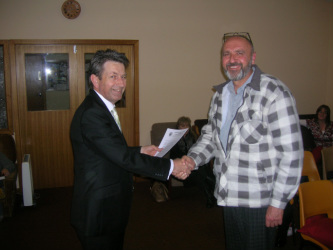 Seen here is Rev Sjirk Bajema, the Interim Moderator of the congregation, handing Andre the signed call. This was an exceptional occasion in the life and history of the congregation - the last call having been issued in 1997. We give thanks to God for the provision of a new ministry that has commenced here. 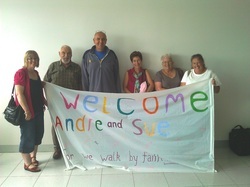 Rev Andre and Sue Scheepers arrived on the 15 Feb 2012.
and commences in the position of resident supply minister here.